Or should that be “Abbrvs Gne Md”? Do you remember the golden age of the telegram? No, of course you don’t. You, dear reader, are far too young! However, you may well have been told about them by your great-grandparents or seen them in an old movie. In short, a telegram was a very early form of today’s text message. Some of the words were either abbreviated or missed off the message completely because the sender paid by the word and wanted to keep the cost down. Those abbreviations were a financial necessity; however, today we seem to have become a generation too lazy to complete a word in our communications. Admittedly, when text messaging first came out we were restricted to 160 characters per message but is that a reason to let the laziness spill over into our everyday life? I have to confess, here and now, that I am hopeless at sending text messages on my mobile phone. It’s not that I can’t send a text; it’s just that I feel the need to spell out the entire word and use the correct punctuation. Which means, by the time I have completed a text, the moment has usually gone! So, what did I mean when I said we’ve allowed the laziness to spill over into our everyday life? Well, just take a walk down your local high street and look in all the independent stores. Hand written signs appearing everywhere with criminal abbreviations. However, these are perhaps forgivable compared with some of the official abbreviations I have seen. A few miles to the east is a retail park. I say ‘Retail Park’; there are three large stores, one fast food outlet and a petrol station! If that is a retail park, what is the little parade of eight shops and six fast food outlets just up the road from me? Back to the ‘official’ retail park, on the main road leading to the roundabout outside it, is one of the worst examples of abbreviations I have seen. The abbreviations were painted on the road by the highways agency to inform the drivers which lane they need to be in to turn into the retail park. There are just two words; not ‘Retail Park’ but ‘Super Store’ (and I’m not going to pick them up on the use of the singular, when there are in fact three super stores!). 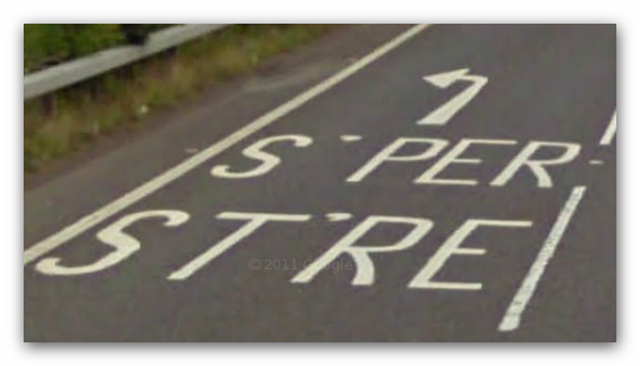 These two words aren’t painted side by side, but are split into two separate lines, meaning there are only five letters stretching across the carriageway. “But wait,” I hear you scream! “You said there were abbreviations”. No room for the u or the o! That strikes me as being downright lazy – there definitely appears to be room for the U and with a little more forethought, room could have been made for the O! Categories: Communication, Driving, English, Light Hearted, Mobile Phones, Pedantry, Postaweek2012, Rants, Shopping, Travel | Tags: Communication, correct punctuation, Driving, English, Light Hearted, Mobile Phones, Pedantry, Postaweek2012, Rants, sending text messages, Shopping, Travel | Permalink.